I have a pretty awesome family. I am pretty lucky. Yes I fight with them but they still love me and have supported me though everything. 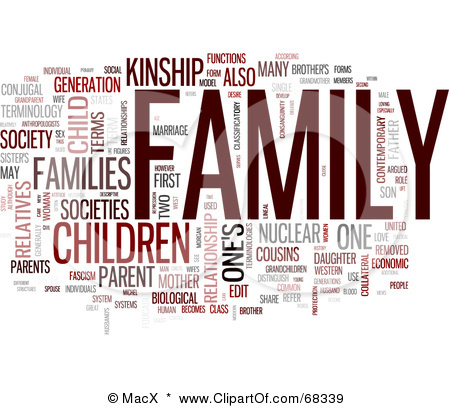 I don’t have a massive family but I am close to all my extended family including all my aunties and uncles. We all love catching up with each other and I try to see them as often as I can. I am also blessed to have all 4 sets of grand parents still with us and even though I don’t really know her that well I also have a great grandmother still alive! So who is in my family. I have my Dad and Mum, they are no longer together. My dad remarried a lovely lady who I call my step mum. My mum also remarried to a lovely man who unfortunately passed away 18 months ago. I am the eldest of 3. I have a sister who is 17 months younger then me who is married to a lovely guy. No kids yet but I am hoping soon I might get to finally get to be an aunty! I also have a younger brother (29 months younger) who has been in a relationship with his partner for over 9 years and who I call my sister in law even though there is no ring! My son is the only grandchild so far and it shows. He is very spoilt by everyone! As I said all my grandparents are still alive. On my dad’s side of the family I have 3 aunties and an uncle. All these are married and I have 8 awesome cousins who I am close to and love catching up with when I get the chance. On my mum’s side of the family I have 2 aunts and an uncle. My uncle is married and my aunts are in relationships. I have 3 cousins on this side of the family. I am close to them too and I actually lived with one of my aunts for 5 years and helped her raise her son as she was a single parent. On top of that I also have some step family some I haven’t met as they live overseas but others I have met and they are all lovely! My family is spread out everywhere. My mum lives in the USA, while the rest of my family is spread out throughout Australia. Its good though as I always have somewhere to stay is I have somewhere I want to go. I love my family and I am very lucky to have them in my life. Do you have a large or small family? Are you close to them?